​This is my 3rd consecutive year at this incredible event. I really like the distance, as with the elevation it is quite a challenge but not so long like an ultra, KOM can be raced to a certain degree, and is so well supported one really needs to carry very little, myself only two gels in my pocket, nothing else not even water as there are plenty of drink stations on course. A week before I did a final long run from Wakefield up to Sugarloaf Dam, most of it on the KOM course, I noted the track was very dry with lots of fine gravel making traction more difficult, this KOM would be tougher than last years I felt. The night before I fueled up on my customary Aldi lasange just before bed. I don't go well if I have solid food on a race day even if it is a few hours before the race. My kit consisted of Flyers singlet, running shorts, Skins long tights, two gels, and the zero drop Altra Paragidm 2 shoes, my Garmin 920Xt watch with defective altimiter and Suunto Ambit Run to record the activities with, and Polar OH1 optical HRM that gives me super accurate heart rate. Saturday KOM day was sunny, cool and breezy, great weather. I arrive a bit after 11 am, sign on and get race number 68. Chat with fellow competitors, a bit of a warm up on the trail behind Mt Sugarloaf. Heart rate initially seemed a bit high but settled down, some pre-race nerves maybe? I had a drink of “pre workout 101”, took a salt tablet just in case of cramps, already taken a Magnesium tablet for the same reason before leaving home. Then the call to head down to the start for the briefing. Like NASA prepping for a space mission I mentally thing through have I got everything, check, laces done up so they won’t come undone, check GPS lock on watch, check, feel ok, check, keen for a run, DOUBLECHECK! NXC president Paul assumes the mike and delivers his usual thorough and well set out briefing, pose for a final pre start pic, self-seed just behind the first row. Bang on 12 midday we are off! The track is almost like bitumen it’s so smooth but those pebbles and gravel mean every step slips that tiny bit, sapping a tiny bit of extra energy as we go. I settle in behind Dave Robertson, who is doing a good job picking the best race line, sticking to the barest parts of the track for better grip. First few kms are well under 4 minute pace, 3:43, 3:59, 3:48, but also slightly downhill. It’s gently undulating till after 3 kms when we hit the first significant hill. We get stuck into it and the heart rate hits 150 bpm, mindful there's a long way to go I don’t go any harder. By now the front end of the field is out of sight. The top of this hill is in fact the highest part of the course, even higher than the start/finish. Now we reach the first significant downhill. Off go the brakes and up goes the pace, I do note it feels more slippery than last year, so I resist the urge to go all out, besides I still have to have the energy to go back up. A glance at the watch, I'm doing 3:10 pace. But this is a kind of false descent as there is another decent hill to climb before the main descent. Hitting that the HR is around 150-148, that and perceived effort tell me I'm within limits and good to keep going. Now the main descent appears, I now feel wind in my almost nonexistent hair, the exhilarating feeling of flying downhill, but touching the brakes so as not to over speed on the loose gravel patches. Indeed the Mountain gave me a respectful warning when my left foot nearly slid out from under me, Traction Control working hard to keep me upright. Dave has fallen back but others near me are up to the task and I don't gain on them. I still tell myself I need to save something for the climb. Rob Roccet comes past on his MTB doping a great job patrolling the course, and very able on the slippery surface making it look easy. I hear cowbells and cheering, the turnaround point and a drinkstation. I see the leader rocketing back up the hill. Then more go past. Time for first gel. I reach the turnaround and wash the gel down with an Endura drink from the station, great job vollies. Now the uphill. Little did I know the effect it would have on the field? Some hate it others embrace it. I'm pretty much neutral and just slog away. I see Viktor reach the turnaround only seconds behind, and he soon catches up. We run together for quite a while, Viktor a few meters in front, we dont chat much we haven’t got the breath to, Vik’s hammering up the hill and I'm struggling to stay in touch. This part of the race is fantastic as we see fellow competitors heading down and we give each other hi fives and encouragement. In the final part of the climb. A runner, Alex rockets past us, Ive never seen such an impressive hill climb before, in moments hes well ahead of us. Won’t see him again I think before the finish. More and more are coming down the hill, piles of hi fives and shutouts. Ive lost count of the number of times Ive heard “Go Scotty” Just love it. Rob Roccet is slogging away uphill on the MTB, amazing he can get traction but he is going well. Just before the top I pass the very accomplished ultra-runner Scott Baker. About halfway up the last steep part Vik starts walking, I'm still chugging away at a very slow run, taking short dolly steps on my toes using my feet as springs to try and save energy. I'm barely going faster than a walk and take a while to go past Vik. But my HR going between 150-152 and perceived effort tell me it’s ok to keep going at that effort. I kind of get in “the zone” and chug away, seeming as if I could go on forever. I reach the top and see runners up ahead, Ive got a bit left in the tank so get motoring along, soon I'm gaining albeit very slowly. At around 19 kms I catch Alex, still feeling ok, some soreness but nothing to worry about. Hit another hill and once again Alex roars past me, just remarkable near the tail end of KOM he can do that. But at 22 km I catch him again, and no big hills to go now! In fact a nice descent sees me do km 22 in 3:48. I'm gaining on a fellow Flyer up front. At around Km23 I reach Emlyn, a word of encouragement then I motor on. Ive no idea who is in front or even how many. Then a possible wrinkle in my race, feeling like a cramp may happen in my left quad. So I rub it as I run, I must have looked silly doing that, but the sensation of a cramp about to happen went away after a few times rubbing it each time I could feel it start to tighten. Then thankfully that feeling didn't come back. Over the final rise now, motoring hard in case of a late attack Paul spots me and announces on the PA “here comes Scott Alder in 3rd place” Did I hear correctly? Surely not. The start/finish is packed with runners about to start the normal Cross Country at 2 pm. Hey it must not be 2 pm yet I think, have I done this thing sub 2 hour? The crowd starts cheering me like mad, wonderful stuff. I motor on and cross the line, am given a finish card, with “3rd” on it. 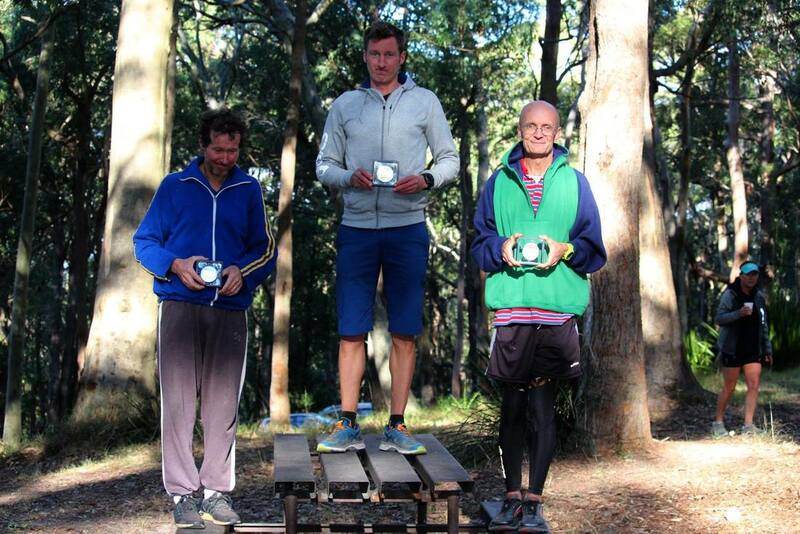 I can’t believe it, amid congrats I walk around in a bit of a daze, a podium in one of the toughest local trail races? I greet the other finishers, lots of hand shaking, just love the comradre of these tough events, just fantastic, how could one not love running. Official time 1:59:42. Talk about sub 2 hour by the skin of my teeth. I was told they were willing me on to go sub 2 hour when I was spotted coming over the final rise! I felt really good after I finished, able to jog around in a bit of a cool down. My time was a bit slower than last year but the loose surface and my finish position tells me it was indeed tougher than last year. A few did manage to PB though so a big lot of congratulations to those especially Shayne Pilgrim with a massive 10 minute PB. Apart from first and to a lesser degree, 2nd, there wasn’t much of a time difference between the next 10 or so finishers, everyone deserves congratulations. ​When I first joined NXC years ago I was awed and intimidated by KOM. I thought it way too hard so didn’t do it. Then, in 2016, after recovering from a nasty bout of Reactive Arthritis that in July 2015 looked to end my running ability, I attempted my first KOM, and loved it. Got a better time in 2017, loved it too, so was only too happy to be back in 2018. So grateful to the running community here, all the fun and encouragement makes training a pleasure, even dragging myself out of bed on chilly morning when it’s still dark :) Getting a result like this is the ultimate reward for effort, especially after a slightly disappointing Winery Half 2 weeks prior. To those who did their first KOM, welcome and congratulations, just finishing it is a monster effort, its not for the casual runner. There were a few slips and spills on the course, trust everyone is okay. The event was very well managed, even having professional 1st aid on a motorbike, which came in very handy. A big shout out to all the wonderful volunteers whose time makes a fantastic event like this happen. 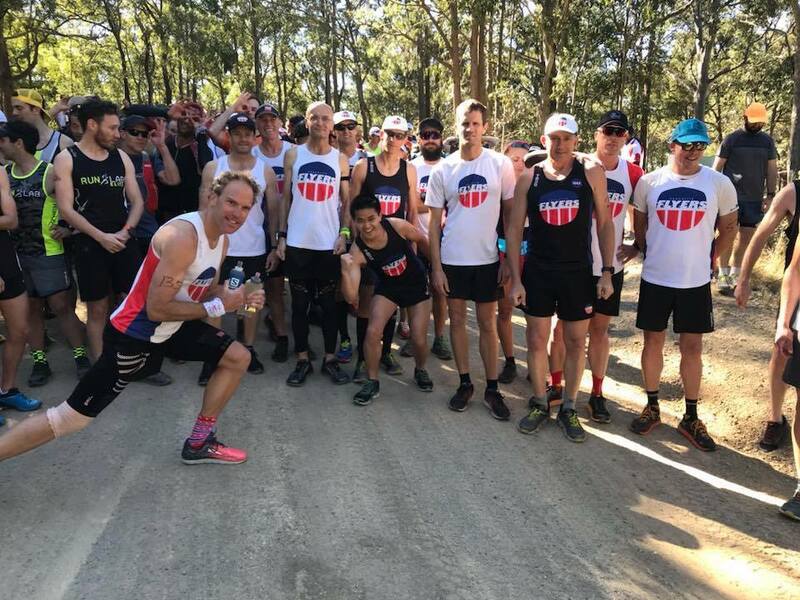 KOM should really become one of the premier trail races on the yearly running calendar in Australia, in fact it was good to see that King and Queen of the mountain were visitors I believe. When 2019 KOM rolls around, do it. 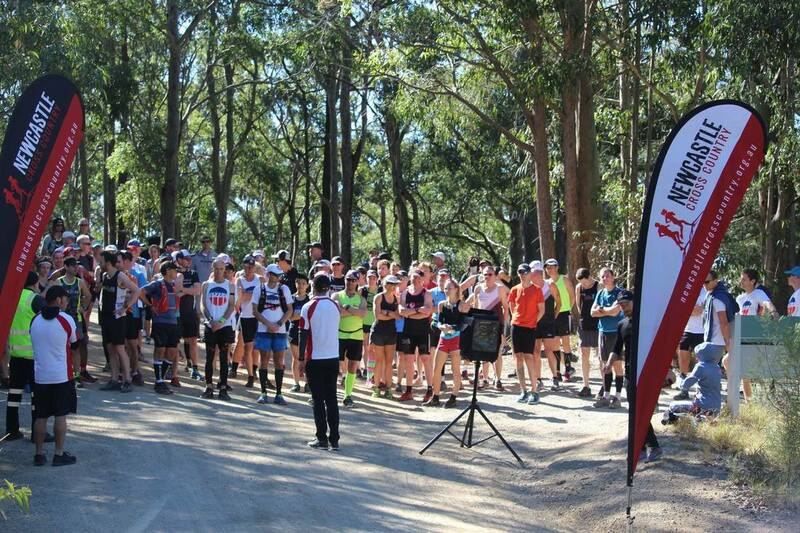 Don’t miss out on such a fantastic trail run experience!